The Feast of Dedication, also called "Feast of the Maccabees," celebrated during eight days from the twenty-fifth day of Kislew (December), chiefly as a festival of lights. It was instituted by Judas Maccabeus, his brothers, and the elders of the congregation of Israel, in the year 165 B.C., to be celebrated annually with mirth and joy as a memorial of the dedication of the altar (I Macc. iv. 59) or of the purification of the sanctuary (II Macc. i. 18). Three years earlier, on the same day, Antiochus Epiphanes had caused a pagan altar to be set up at the altar of burnt offerings in the Temple at Jerusalem, and sacrifices to be offered to his idol (I Macc. i. 41-64; II Macc. vi. 2). The idol called "Zeus Olympius" was probably also called "Ba'al Shamayim," of which seems to be a cacophemy (Dan. xi. 31, xii. 11; I Macc. i. 54; see Hoffmann, "Ueber Einige Phönizische Inschriften," 1889, p. 29). After having recovered the Holy City and the Temple, Judas ordered the latter to be cleansed, a new altar to be built in place of the one polluted, and new holy vessels to be made. When the fire had been kindled anew upon the altar and the lamps of the candlestick lit, the dedication of the altar was celebrated for eight days amid sacrifices and songs (I Macc. iv. 36), similarly to the Feast of Tabernacles (II Macc. x. 6; comp. ib. i. 9), which also lasts for eight days, and at which during the Second Temple (Suk.v. 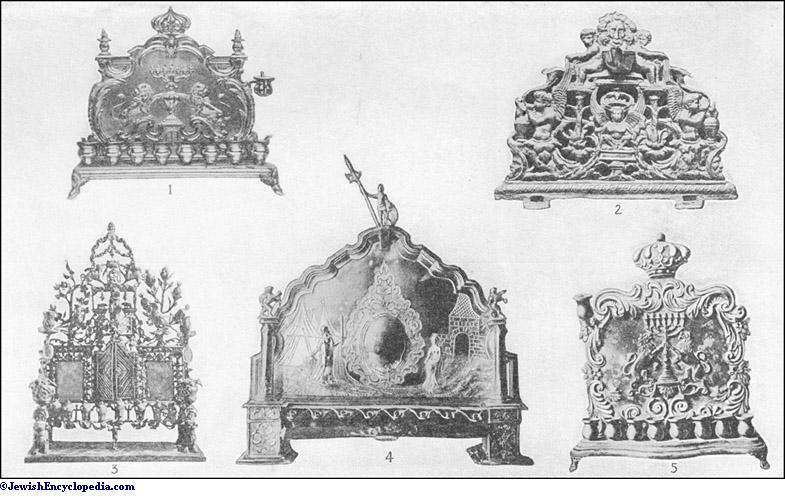 2-4) the lighting of lamps and torches formed a prominent part. Lights were also kindled in the household, and the popular name of the festival was, therefore, according to Josephus ("Ant." xii. 7, § 7), Πῶτα = "Festival of Lights." 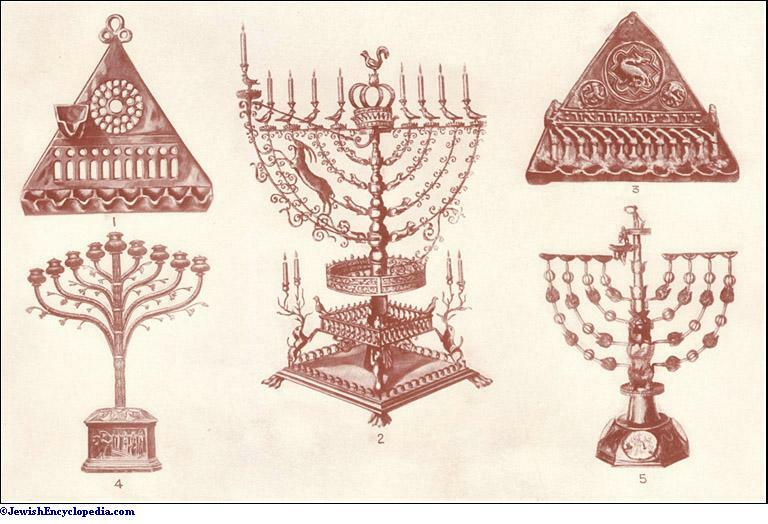 In the Talmud it is principally known as the "Feast of Illumination," and it was usual either to display eight lamps on the first night of the festival, and to reduce the number on each successive night, or to begin with one lamp the first night, increasing the number till the eighth night. The Shammaites, usually representatives of the older traditions, favored the former custom; the Hillelites advocated the latter (Shab. 21b). Josephus thinks that the lights were symbolical of the liberty obtained by the Jews on the day of which Ḥanukkah is the celebration. The Talmudic sources (Meg. eodem; Meg. Ta'an. 23; comp. the different version Pes. R. 2) ascribe the origin of the eight days' festival, with its custom of illuminating the houses, to the miracle said to have occurred at the dedication of the purified Temple. This was that the one small cruse of consecrated oil found unpolluted by the Hasmonean priests when they entered the Temple, it having been sealed and hidden away, lasted for eight days until new oil could be prepared for the lamps of the holy candlestick. A legend similar in character, and obviously older in date, is that alluded to in II Macc. i. 18 et seq., according to which the relighting of the altar-fire by Nehemiah was due to a miracle which occurred on the twenty-fifth of Kislew, and which appears to be given as the reason for the selection of the same date for the rededication of the altar by Judas Maccabeus (comp. Ḥag. iii. 10, 18, 20; Num. R. xiii. 4). The actual reason for the selection of the twenty-fifth of Kislew by Judas Maccabeus for the dedication of the altar is stated to have been, as mentioned above, that on the very same day three years earlier Antiochus Epiphanes had a pagan altar set up at the altar of burnt offerings in the Temple of Jerusalem and sacrifices offered to his idol (I Macc. i. 41-64; comp. II Macc. vi. 2, where the heathen god is called "Zeus Olympius"). The twenty-fifth of Kislew was accordingly a day sacred also to the heathen before it became a Jewish festival. According to Ewald ("Gesch. 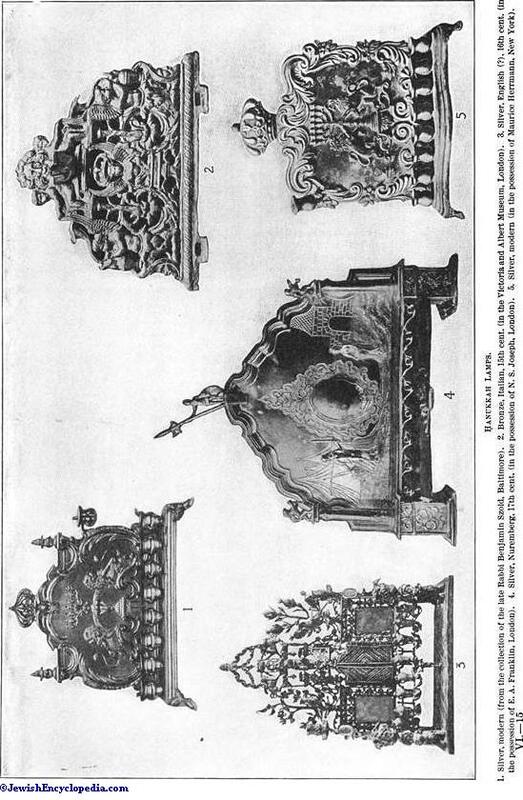 des Volkes Israel," 3d ed., iv. 407) and Wellhausen ("Israelitische und Jüdische Gesch." p. 210; comp. Paulus Cassel, "Weihnachten," pp. 57, 97, and p. 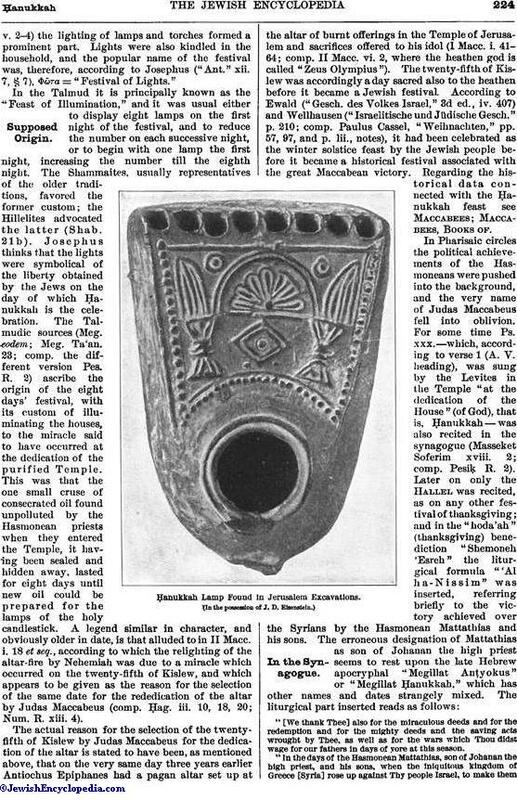 lii., notes), it had been celebrated as the winter solstice feast by the Jewish people before it became a historical festival associated with the great Maccabean victory. Regarding the historical data connected with the Ḥanukkah feast see Maccabees; Maccabees, Books of. 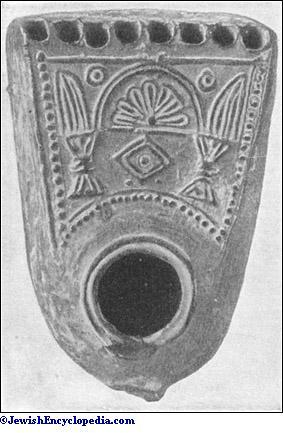 Ḥanukkah Lamp Found in Jerusalem Excavations. "[We thank Thee] also for the miraculous deeds and for the redemption and for the mighty deeds and the saving acts wrought by Thee, as well as for the wars which Thou didst wage for our fathers in days of yore at this season. 1. Bronze, French, attributed to 12th cent. (in the Musée de Cluny, Paris). 2. Yellow copper, modern (in the synagogue at Pogrebishche, Russia). 3. Silver (? ), medieval (in the possession of Dr. Albert Figdor, Vienna). 4. Yellow copper, modern (in the synagogue at Padua, Italy). 5. Silver and bronze, 17th cent. (in the possession of Jacob H. Schiff. New York). 1. Silver, modern (from the collection of the late Rabbi Benjamin Szold, Baltimore). 2. Bronze, Italian, 15th cent. (in the Victoria and Albert Museum, London). 3. Silver, English (? ), 16th cent. (in the possession of E. A. Franklin, London). 4. Silver, Nuremberg, 17th cent. (in the possession of N. S. Joseph, London). 5. Silver, modern (in the possession of Maurice Herrmann, New York). "In the days of the Hasmonean Mattathias, son of Johanan the high priest, and his sons, when the iniquitous kingdom of Greece [Syria] rose up against Thy people Israel, to make them forget Thy Law and to turn them away from the ordinances of Thy will, then didst Thou in Thine abundant mercy rise up for them in the time of their trouble, plead their cause, execute their judgment, avenge their wrong, and deliver the strong into the hands of the weak, many into the hands of few, the impure into the hands of the pure, the wicked into the hands of the righteous, and insolent ones into the hands of such as are occupied with Thy Law. Both unto Thyself Thou didst make a great and holy name in Thy world, and unto Thy people didst Thou achieve a great deliverance and redemption as at this day. Whereupon Thy children entered the sanctuary of Thy house, cleansed Thy temple, purified Thy sanctuary, kindled lights in Thy holy courts, and appointed these eight days of Ḥanukkah in order to give thanks and praises unto Thy holy name." The Pentateuch readings for the eight Ḥanukkah days are taken successively from Num. vii., the chapter relating to the gifts of the twelve princes of Israel on the occasion of the dedication of the altar of the tabernacle in the wilderness. On the eighth day the verses Num. vii. 54-viii. 4 are read, the last four verses referring to the kindling of the lights of the holy candlestick (Meg. iii. 6; Bab. 31a). The twenty-fifth of Kislew was taken by tradition to have been also the date of the dedication of the altar in the time of Moses (Pesiḳ. R. 6; Ex. R. lii. ; Num. R. xiii. 4). 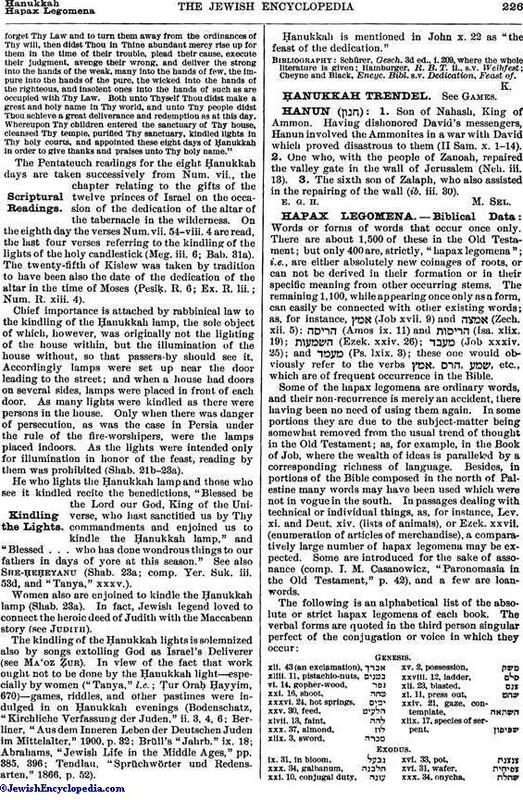 Chief importance is attached by rabbinical law to the kindling of the Ḥanukkah lamp, the sole object of which, however, was originally not the lighting of the house within, but the illumination of the house without, so that passers-by should see it. Accordingly lamps were set up near the door leading to the street; and when a house had doors on several sides, lamps were placed in front of each door. As many lights were kindled as there were persons in the house. Only when there was danger of persecution, as was the case in Persia under the rule of the fire-worshipers, were the lamps placed indoors. As the lights were intended only for illumination in honor of the feast, reading by them was prohibited (Shab. 21b-23a). He who lights the Ḥanukkah lamp and those who see it kindled recite the benedictions, "Blessed be the Lord our God, King of the Universe, who hast sanctified us by Thy commandments and enjoined us to kindle the Ḥanukkah lamp," and "Blessed . . . who has done wondrous things to our fathers in days of yore at this season." See also She-ḥeḥeyanu (Shab. 23a; comp. Yer. Suk. iii. 53d, and "Tanya," xxxv.). Women also are enjoined to kindle the Ḥanukkah lamp (Shab. 23a). In fact, Jewish legend loved to connect the heroic deed of Judith with the Maccabean story (see Judith). The kindling of the Ḥanukkah lights is solemnized also by songs extolling God as Israel's Deliverer (see Ma'oz Ẓur). In view of the fact that work ought not to be done by the Ḥanukkah light—especially by women ("Tanya," l.c. ; Ṭur Oraḥ Ḥayyim, 670)—games, riddles, and other pastimes were indulged in on Ḥanukkah evenings (Bodenschatz, "Kirchliche Verfassung der Juden," ii. 3, 4, 6; Berliner, "Aus dem Inneren Leben der Deutschen Juden im Mittelalter," 1900, p. 32; Brüll's "Jahrb." ix. 18; Abrahams, "Jewish Life in the Middle Ages," pp. 385, 396; Tendlau, "Sprüchwörter und Redensarten," 1866, p. 52). 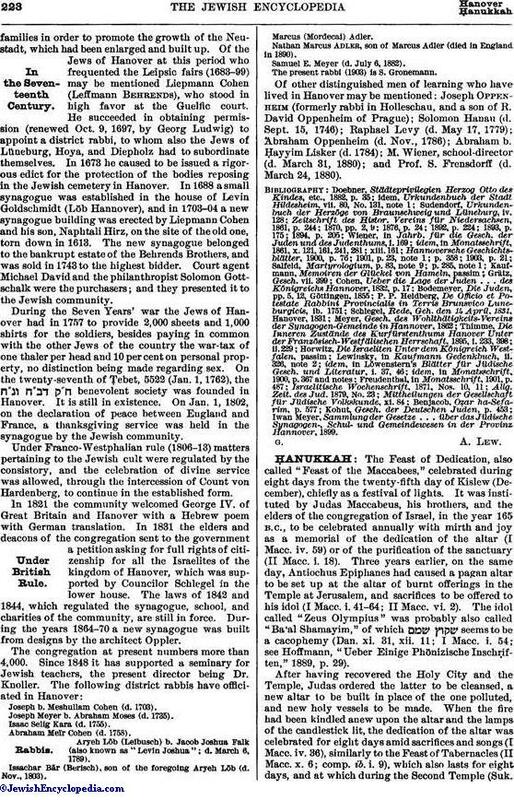 Ḥanukkah is mentioned in John x. 22 as "the feast of the dedication." Cheyne and Black, Encyc. Bibl. s.v. Dedication, Feast of.